What is the gut microbial community in honey bee queens, and how does early physical separation of queens from her workers affect this community? This work is from my first year as a PhD student at University of Texas at Austin. I wanted to better understand how the microbial community inside the gut of honey bees affect its host. I began looking honey bee queens, as very little was known on how different their gut community was compared to her workers. 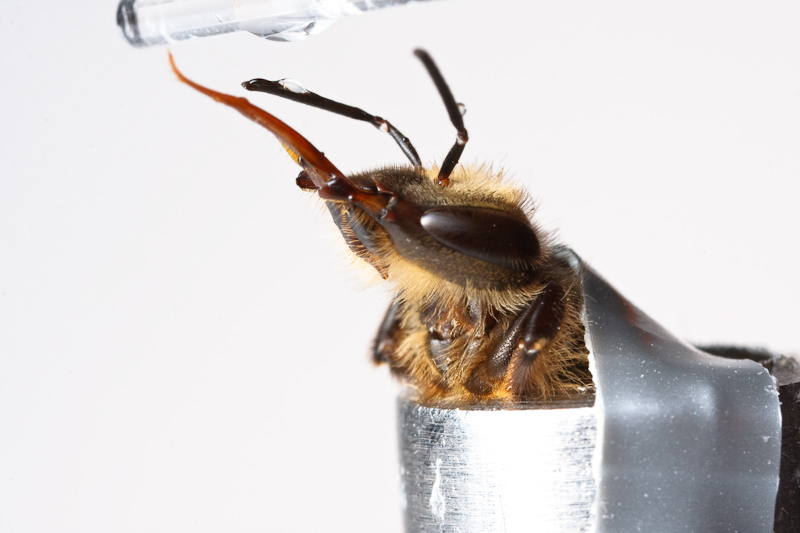 In queen rearing practices, it is also very common to keep newly emerged queens physically separated from her workers by keeping them in cages so that the only contact a queen would have with her workers is through trophallaxis. Does this change the microbial community in her gut? Surprisingly, queens kept in isolation had more total amount of gut bacteria. This lasted even in their adult life when they were released from their cages. The consequences of this remains unknown. There are several factors that contribute to the decline of honey bee colonies. One disease in particular, nosemosis, is caused by the microsporidian (fungal) pathogen Nosema spp. This pathogen is thought to only infect adults. However, some studies have reported the detection of Nosema DNA in pupae and larvae. In collaboration with Dr. Suwannapong from Burapha University, Thailand, we directly tested whether honey bee larvae can become infected by Nosema ceranae. By rearing larvae in vitro and providing a single dose of N. ceranae spores at three days old (post egg hatching), histological cross-sections of pre-pupae show the presence of N. ceranae spores in midgut epithelial cells. Infected larvae that were reared into adulthood also had greater mortality rate as compared to non-infected larvae. Our results suggest that under laboratory conditions, larvae are susceptible to infection and subsequently have a reduced lifespan. Future studies should investigate whether infection occurs under natural conditions. Eiri, DM, Suwannapong, G., Endler, M, Nieh, JC. (2014) Nosema ceranae can infect honey bee larvae and reduce subsequent adult longevity. American Bee Research Conference, San Antonio, TX. American Bee Journal. April 2014. By stimulating the antennae with sucrose, a honey bee will respond by sticking out its proboscis (tongue) to feed. Neonicotinoid pesticides are frequently used to protect agricultural crops from pests. This recent class of pesticides were thought to be safer for non-target organisms like pollinators due to its ability to be applied to crops without traditional spraying methods (e.g., drip irrigation, seed treatment). Unfortunately, traces of the chemicals have been found in pollen and nectar, resources that honey bees and other pollinators are dependent on. These concentrations are not lethal, but several studies have found behavioral effects that are caused by low, sublethal concentrations. In 2012, work done by myself and my advisor found that at these sublethal concentrations, honey bee foragers have an increased preference for sweeter nectar sources (as measured by the sucrose response threshold). We also found reduced activity of waggle dancing by pesticide-treated bees. Eiri, DM, Nieh, JC. (2010) Sublethal doses of the pesticide imidacloprid alter honey bee (Apis mellifera) response threshold and optic flow, potentially affecting colony health. 10th Annual North American Pollinator Protection Campaign Conference, Washington D.C..